In response to ESPN host Max Kellerman saying Notre Dame should drop its Fighting Irish mascot, Republican Rep. and 2018 Senate candidate Luke Messer (Ind.) tweeted Thursday that commentators at ESPN have "given up on sports and now only care about being politically correct." Kellerman, host of ESPN's "First Take," recommended the Notre Dame mascot change on Tuesday during a discussion about the Cleveland Indians's decision to drop its Chief Wahoo mascot. In response to Kellerman's comments on the Indiana university, Messer wrote in a series of tweets that ESPN "has lost it's[sic] mind. They've given up on sports and now only care about being politically correct…they ought to change their name to ESPC." He also wrote that the Fighting Irish mascot "represents the fighting spirit of @NotreDame sports teams over the last century," and that "this is political correctness gone crazy." Messer's response was not the first time he voiced his opinion on a sports related issue. In a recent op-ed in the Washington Examiner, Messer criticized the NFL for turning down a Super Bowl advertisement from AMVETS that depicted a veteran holding the American flag and included the hashtag #PleaseStand. "The commissioner and many NFL owners bent over backwards to accommodate political speech," he wrote. "Now that our veterans are speaking up, too, and asking their fellow citizens to stand for the anthem, this issue is suddenly ‘too political' for the NFL to swallow." The op-ed pointed to the NFL's falling approval ratings and television ratings as "consequences" of it being a "mouthpiece for the left." 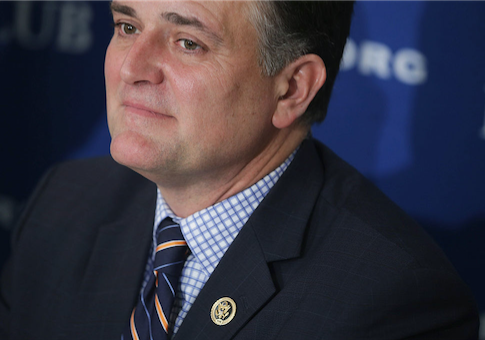 Messer, who currently represents Indiana's 6th Congressional District, announced in July of 2017 that he would challenge Democratic incumbent Joe Donnelly for the Senate seat rather than run for reelection. This entry was posted in Culture and tagged ESPN, Indiana, Notre Dame. Bookmark the permalink.